Although All Quiet on the Western Front is the best known, and possibly the best written, novel of soldiers at the front in WW I, there are others, anti-war to some degree, written by other soldiers of other countries — and recently a marvelous short novel, The Absolutist, which is a re-creation of a time and place by John Boyne, an author not then alive and not now a soldier. Generals Die in Bed is a short, terrific novel by a Canadian who was in the trenches at the Battle of Amiens, in 1918. Paths of Glory, by fellow Canadian Humphrey Cobb, is well-known to most from Kubrick’s film of the same name. John Dos Passos’ Three Soldiers isn’t as well-remembered or thought of as fellow American Ernest Hemingway’s A Farewell to Arms, which is mostly remembered as a love-story. It has short punchy anti-war grousing by several of the characters and a few terrific battle scenes, which perhaps because of their sharp interruption of an adventurer’s life, stand out more in memory than in the novel itself. Two French novels are important members of the same war-is-hell (and stupid) club, Wooden Crosses by Roland Dorgeles (which was made into a powerful film of the same name) and Under Fire by Henri Barbusse, the first of all the war novels, appearing in 1917 and wining the Prix Goncourt. Barbusse was an experienced writer and journalist when the war came. He had several volumes of poetry, one of short-stories and a Zola-esque novel of dark naturalism titled L’enfer (The Inferno) in publication. He was to continue writing for the rest of his life. He was a socialist and somewhat of a pacifist, above all an idealist, as his later life showed. And, he was old — 41 when he enlisted in the French army in 1914. After being evacuated in the early months for lung problems, he tried to return as a stretcher-bearer and then as a member of the staff. Sent to the rear again, he tried once more to get near the front. Under Fire is the result of those experiences. I’ve been reading two translations, the earlier one, 1926 by W. Fitzwater Wray and a later 2003 version by Robin Buss. The excerpts here are from Wray which, surprisingly, I thought was stronger, though not by much. “…they throw themselves on the food, and eat it standing, squatting, kneeling, sitting on tins, or haversacks pulled out of the holes where they sleep..
and the way in which, in the midst of war, soldiers will throw themselves on each other for petty or imagined insults. “There are four Divisions, at present, in an Army Corps,” replies Cocon; “the number changes, sometimes it is three, sometimes five. Just now, it’s four. And each of our Divisions,” continues the mathematical one, whom our squad glories in owning, ” includes….. Under Fire, devotes substantial pages to the odd way –for modern ideas of war– in which soldiers billeted themselves, when not actually in the trenches, with locals, renting or begging barn space, or if an officer, a bedroom. One small child confides to the soldiers that his papa hopes the war goes on forever –they are getting rich. What is striking is that the homes and barns are not requisitioned by the army and the soldiers assigned, but that squads go and figure it out themselves. In Sebastian Junger’s Storm of Steel, Germans, in occupied France, did the same. Supply trains with food, tents, blankets, for all that it was a stationary front, didn’t have the same level of importance and resources that armies since WW I are expected to have. The ancient code of pillage and forage, by now tamed somewhat, was still part of the ethos of battle. No one, apparently, has authority to make him stand, or change. The others, his friends, are likely as sullen and exhausted as he. Novels from more recent time, say Matterhorn by Karl Marlantes, about Vietnam or The Yellow Birds by Kevin Powers, about the Iraq invasion, depend a good deal on the tensions between the ranks, both designated and innate, to get at the essential matters, not the fighting or the misery itself but how human beings behave under those conditions. Not that there isn’t plenty of contempt for the brass in Under Fire; that was a sine qua non for novels of WW I, and apparently well deserved. But it is contained in grousing among the men, not in orders given, resistance taken. As in all the novels and memoirs of WW I I have read, rain, endless rain, is almost a worse enemy than the weapons of the other side. Torrential rain was falling. We were muddled and drenched and hustled by the flood, and we ate standing in single file, without shelter…The rain rattled and bounced and streamed on our limp, woven armor, and worked with open brutality or sly secrecy into ourselves and our food. Our feet were sinking farther and farther, taking deep root along the clayey bottom of the trench. Because Barbusse allows himself the time, and has the inclination, we hear of the shooting of shirkers by their own squad mates, rats swimming in flooded parts of the barn used as sleeping quarters, a man seeing that his family home has been blown to bits. There is time to show the men reminiscing about where they have come from and talking about what they will do, in extensive pages of dialog — which as other parts of the novel, suffers in translation. 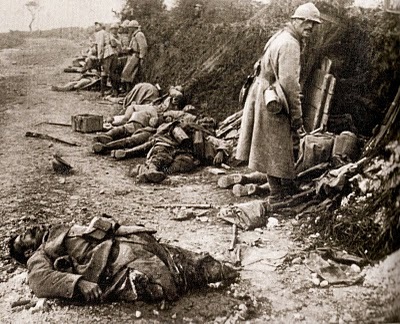 I could not shake the ‘wrongness’ of hearing French soldiers calling each other “old chap.” The conversations do give us a rich image of the men and the times, but at the expense of tension and build to the story being told. Although interesting in many of its parts it reminded me a great deal of the journal/memoir, Storm of Steel by the German, Ernst Junger. Each has the beads of days on the string of war, but they have not been selected, culled and edited to create an emotional narrative to catch the hearts of those who stand outside of the events themselves. One sub story that will stick with me is that of a Frenchman from Alsace who hears French being spoken on the German side. A conversation is struck up and the German Alsatian offers to smuggle the French Alsatian into his town, occupied by the Germans, to see his home. He cannot visit; he can only look. The dangerous favor is carried out and the Frenchman sees his wife talking happily to two German soldiers, at his own table, and the widow of his best friend, who had died beside him, letting another German play with her child. He is nearly beside himself, but contains it until he is back at his own lines, where he tries to rationalize what he has seen, and what he dreads. What a marvelous outline for a stand-alone story! Another, much more gruesome memory I’ll have of a story in Under Fire, because it is duplicated in the Canadian authored Generals Die in Bed, is that of the overwhelming importance of boots. The poverty, at least of the Allies, was so great, that to find boots on a dead man was a gift from heaven. Both novels have soldiers tell dark stories of finding boots, better than their own, still on the legs of dead officers, and twisting and ripping them off, cleaning the dead limb from the leather so they can be worn. That both novels have the story may be unusual. I have no idea how often such deeds took place, or if perhaps it was an apocryphal story, useful for all to impress those who hadn’t been there with the horror of it all. Is this an awkward translation or does it reflect something awkward beneath it, or both? I don’t have the French so I don’t know if “wings” is in it, or is imaged up by Wray. It does makes a stronger image of life being trapped than Buss’ “flapping” which, in any case, if these are “bits of paper” they wouldn’t be doing. My attempt: Letters flutter around the dead, escaped from pockets or cartridge belts that fell on the ground. I can read, by bending a little, one of the small white papers, caught in the mud and twitching in the wind, the sentence — Dear …. Translation is an endless trial, the results of which never satisfy everyone. That said, it is too bad, to my mind, that the first novel of WW I, which came out early enough to be read, and presumably have an effect on soldiers and civilians alike, is not a stronger, more persuasive read. Not perhaps the first novel one should read about WW I and the trauma of war but certainly one for any, even casual, student of human strife and folly.